Synonyms: Adept, agile, clever, competent, cunning, deft, devious, dexterous, discreet, handy, methodical, modest, mundane, nifty, neat, nimble, organized, political, practiced, repetitive, sensible, shrewd, solid, sparing, stylish, tactful, skillful, systematic, subtle, worthwhile. 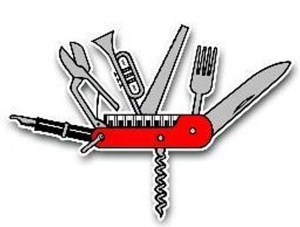 Capricorns are able to employ whatever is at hand to best advantage, giving the sign its key-phrase, I Use. They are equally at home in and can adapt to any environment. 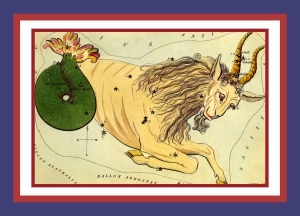 The ancient constellation does not represent a common goat such that travels merely on land; rather, it has the tail of a fish enabling it, when occasion requires, to also live in the water. Astrologers hold that the best quality of Capricorn is Diplomacy and when this ability is abused it becomes the worst quality of the sign—Deceitfulness. As a morality tale, the use of false pretense to aid the ambition to climb to wealth and power is set forth quite clearly in the Old Testament story of Jacob and Esau who, even before they were born, were struggling together in the womb of their mother—portending conflict to come. (Genesis 27). Jacob and Esau were the sons of Isaac and Rebekah and the first twins mentioned in the Bible. From a Stellarian perspective Esau, an outdoorsman of generous spirit, represents the sign Sagittarius while Jacob, with his flair for trading and his desire to advance himself among people, represents the material sign Capricorn. About to die, Isaac began preparations to bestow the birthright blessing upon Esau. Esau was sent to the field with quiver and bow to take some venison for the ceremony. Upon learning their father was about to bestow the birthright blessing upon Esau, Jacob conspired with his mother and, through deceit and shrewdness, plotted to steal his elder brother’s birthright blessing. Disguising himself as Esau, Jacob presented himself as Esau to the blind Isaac who thereupon bestowed the blessings to the wrong son. Both Sagittarius and Capricorn are business signs. Just as there is a thin line (solstitial colure) between the season of plenty and the winter season of scarcity, so there exists a thin line in business and industry that divides the energy of benevolent Jupiter, ruler of Sagittarius, and the selfish tendency of Capricorn. Only at its worst does Capricorn relate to deceit. On its better side, it is shrewd and skillful in recognizing and organizing resources that benefit those in need. The text therefore is: Every Environment Offers Opportunities for Spiritual Advancement, and He who Makes Good Use of His Present Circumstances for Spiritual Ends Will Attract New Opportunities. The companion Spiritual Capricorn exercise by Christopher Gibson can be accessed by clicking on the image below or here.